In typical French style chef Patrick Caals introduced the class of 12 students to the art of making perfect stocks for meat, chicken and fish while his team of assistants scurried to bring him the various pre prepared pots and pans at the right moment so that we could see, taste and smell the various stages of production. It was hot in the kitchen so a mid morning kir was most welcome! We were a veritable United Nations of a class with Canadian, American, Australian, Chinese, French and English students all learning how to put the finishing touch to our meals with homemade sauces. Once we had made our contributions to the stocks, we proceeded to make blanc de volaille sauce supreme (a delicious mushroom sauce for chicken), magret de canard a l’orange (my husband’s favourite), and my top dish of prawns and langoustines with an a l’Americaine sauce. We also made a pesto sauce, Bordelaise sauce, roasted tomato sauce as well as bearnaise and hollandaise sauces. Coupled with the exquisite cakes secured after the lesson, this was a feast to be proud of. What I really liked about the course was the attention to detail which permeated everything from the exquisite buffet lunch to the presentation of our dishes to take home. 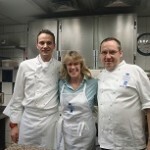 I was impressed that a pastry chef I last met three years ago remembered me – hats off to chef Xavier Cotte! 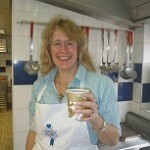 I thoroughly recommend the courses at www.lcbparis.com. Let me know what you think if you try one.